Halo by Alexandra Adornetto, The House of Tomorrow by Peter Bognanni, and The Wager by Donna Jo Napoli, plus a swag pack! and must be 13 or older! 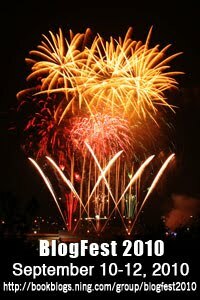 Don't forget about the massive BlogFest 2010 grand giveaway! Head on over to http://ajourneyofbooks.halfzero.net and click on the Tracking Site link to head to our own exclusive tracking site. Once there you can register with a valid email address (to be used solely for the purpose of contacting the winner). This site will allow you to track your progress through BlogFest 2010! You can log on from anywhere at any time and continue where you left off. The best part is that every blog that you visit and mark off through this tracking site will give you one entry into the massive giveaway! We have a great collection of books, goodies and other swag that is looking for a new home! I really want to read Halo! Thanks for the giveaway! Oooh Halo! I really want to read this one! Thanks for the giveaway! Wow! What great prizes! Too bad i live in New Zealand, I would have loved to enter! Lol. Wow, these sound great please enter me in the drawing. Fabulous giveaway. Thanks for sharing! Thank you for the wonderful giveaway! My BlogFest giveaways are here. Thanks for being part of Blog Fest and for the opportunity to enter this giveaway. I think book fiends will rule the world! Am not eligible, but enjoyed visiting your site. I'm a new follower. Great contest! Fins are forever cover reveal!